Standard Business Cards is rated 4.6 out of 5 by 108. Create business cards that boost your brand and start a conversation. Rated 5 out of 5 by Rhino from As promised. The cards were just as I ordered and delivered on time. Thanks for the prompt service. Rated 5 out of 5 by annuity123 from Good Quality I bought 250 cards for same-day pickup and they were prepared quickly and easily. I had previously bought postcards from here and I will continue to buy their products. Rated 5 out of 5 by TL Putnam from My Preferred Vendor. As a designer, I’ve used Print Place dozens of times. They have prices that rival the digital presses, but deliver the superior quality and perfect clarity of an offset press. Rated 5 out of 5 by Hutyoasis from Great Color This is my second set of cards and the color is fabulous and evenly distributed on both sides! Quality and durability! 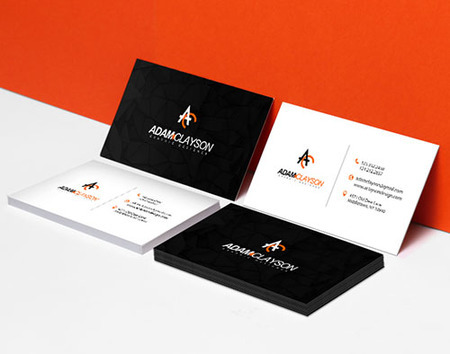 Business card printing is crucial for networking with potential clients and customers, whether you choose a standard style or create custom cards. They are an essential, tangible tool to deliver brand and contact information. These also establish and strengthen the impression you make at every meeting. Choose from two premium materials that are the default choice for business cards. If you’re still unsure about which option to choose, read our comprehensive guide on the different paper materials and coatings available. We offer the standard size for business cards, along with other distinct dimensions. 2” x 3.5” or the US standard business card size easily fits in most wallets and card holders. 2.5” x 2.5” or square size is slightly wider and taller than the standard. Its unique shape instantly distinguishes your company in a stack of business cards. 1.75” x 3.5” or slim is a little thinner than the standard but fits inside a standard business card holder. If you’re curious, check out our informative guide on the standard business card sizes in other countries. It’s important to include the following guidelines around your business card design. These portions ensure no part of the design is cut and every aspect is showcased after you print standard business cards. Safety line surrounds the entire business card design. It should border all the relevant information & main parts of your card. Bleed line refers to the ends of the whole file. Make sure the design’s background color reaches here. Trim area provides an allowance between the safety line and bleed line. This prevents any cutting errors on the printer’s part. If you’re not confident about measuring these guidelines, you can download our available business card layout templates. These already contain the above guidelines to prevent any design or cutting errors. Get a head start making a big impression. Order business cards with PrintPlace today and our experts will help you every step of the way. You can also add shrink wrapping for extra protection during shipping. What are some crucial questions to ask before I create my business card? What kind of image do I want to convey? Who is my target market/clientele? What is the most important part of the card? How do I want my card to stand out? Which material is recommended for double sided printing? Both the 14 pt. and 16 pt. cardstock are thick enough to showcase relevant information and company designs on both sides of your card. The 16 pt. cardstock is much thicker and is used by companies and individuals who really want their cards to stand out. Our standard business cards can be printed within the same day of your order or on the next business day depending on your deadline. The order will then be shipped after your preferred turnaround time. To make designing and printing your business card online easier, PrintPlace offers layout templates.These templates provide you with the right specifications to ensure your design is printed correctly. Download one of the formats below to start. Use one side on your business card design to engage and surprise your customers. Offer a bit of relevant trivia, testimonials, a sponsored social cause, a challenge, or even a coupon code. Consider adding a memorable design, or even your own face to add a more human element to your cards. Standard business card printing may only be 2 ”x 3.5”, but that extra space can be more than enough to tell a story.